Yeah. This is a thing. Had an idea earlier today about a truck that was following a person around and ended up with a truck that misses its owner. I like it. Special Containment Procedures: Neither SCP-3913 nor SCP-3913-1 may be moved from their designated locations without approval from the 3913 Project Head and subsequent revision of these containment procedures. SCP-3913 is to be kept in Site-88's above-ground anomalous vehicle bay. A GPS tracking device is to be installed inside SCP-3913's cab. Obstructions between SCP-3913 and public roadways must be removable in case of an SCP-3913 breach. Manipulation of SCP-3913-1's location is the only approved method of directing and/or limiting SCP-3913's motion. SCP-3913-1 is to be kept in the cadaver preservation department on floor 3 of Site-88. During storage, SCP-3913-1 must be kept within 2.56 kilometers of SCP-3913's current location. 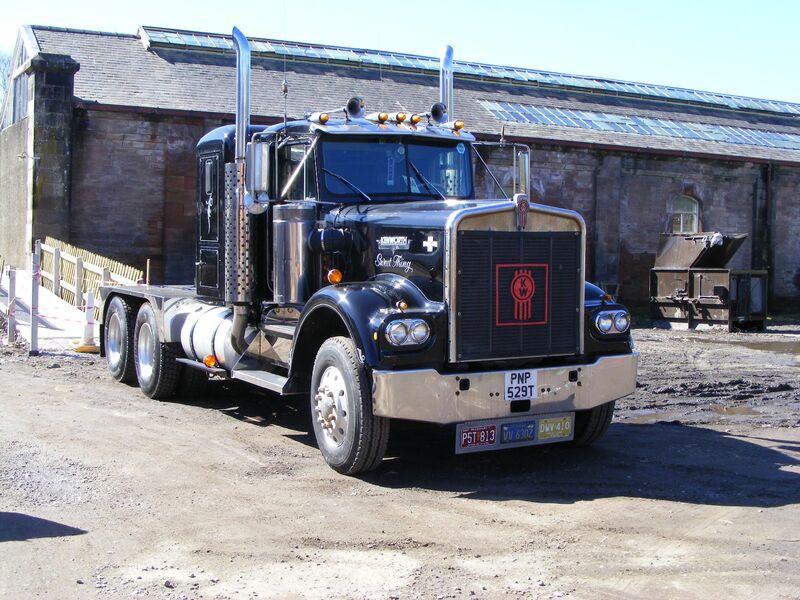 Description: SCP-3913 is a Kenworth W900A 1979 model semi-trailer truck. If more than 2.56 kilometers from the corpse of Jedediah Phillips (hereafter referred to as SCP-3913-1) SCP-3913 will begin independent operation and move towards SCP-3913-1. SCP-3913 does not require fuel to operate in this manner. During independent operation, SCP-3913 will attempt to navigate around physical barriers between it and SCP-3913-1. If such navigation is impossible those physical barriers will be breached in order to reach SCP-3913-1. This will occur regardless of the strength or thickness of the physical barrier. SCP-3913 has also shown a capacity to cross terrain which would normally preclude navigation by non-anomalous vehicles of this type and model. Once reaching a minimum distance of 2.56 kilometers from SCP-3913-1, SCP-3913 will cease independent operation. SCP-3913's outward appearance will degrade over time without maintenance. Components required for the purpose of hauling freight and housing a driver are, however, resistant to all forms of damage. Furthermore, regardless of the degradation of SCP-3913's outward appearance, the words "Sweet Thing" are always clearly visible in at least one location on the object. SCP-3913 was owned and operated by SCP-3913-1 from 1981 to 2004. On July 5th 2004, SCP-3913-1 was diagnosed with a stage IV pancreatic adenocarcinoma. During treatment, SCP-3913 was stored approximately 2.1 kilometers from the hospital treating SCP-3913-1. Following SCP-3913-1's death on August 29th, 2004, SCP-3913-1 was moved and SCP-3913's anomalous properties were first observed. On December 7th, 2011 SCP-3913's mechanical systems began to operate independently, despite being within 2.56 kilometers of SCP-3913-1. SCP-3913 did not, however, attempt to breach containment during this time. Research into potential causes led to the identification of Jedediah Phillips III, one of SCP-3913-1's grandchildren. On December 6th 2011 this individual had received a commercial driver's license in the state of Alabama. This individual also performed online searches related to the purchase of a semi-trailer truck on the same day. SCP-3913's project head approved the purchase of a modern semi-trailer truck to be provided covertly to Jedediah Phillips III at a price commensurate with the individual's financial resources. Following the transfer of this item to Jedediah Phillips III, SCP-3913's behavior returned to its previously observed pattern.